The general strike that swept Spain on November 14 was a fusion of traditional union efforts and a new breed of radical protest entirely. The insistent thrum of the helicopters patrolling overhead began early in the morning. The sound has become familiar in Madrid, a stand-in for the police surveillance and repression that has increased in tandem with the austerity-steeped city's newfound penchant for regular, raucous protests. On this particular morning, though, the government had reason to worry: it was the day of the eighth general strike in Spain’s democratic history, and already the second one under Prime Minister Mariano Rajoy, whose conservative government was barely one year old. The strike was called by the main trade unions of Spain, along with the Cumbre Social, a summit of some 150 organizations including Amnesty International, Red Cross, Save the Children, and Greenpeace. Non-traditional unions, like the anarchist Confederación General de Trabajadores (General Workers' Federation), as well as members of the 15M social movement, joined forces for the day’s demonstrations. The organizing demand of the strike did not seek specific benefits, but rather an official referendum asking the Spanish population if it agrees with the measures adopted by Rajoy's governing conservative party, the Partido Popular (PP). Do the Spanish people support projects like the so-called “flexibilization” of working conditions and recent deep cuts in social spending? The strikers wanted to put it to a national vote. A straight-forward chant began the day: “They leave us without future/There are culprits/There are solutions.” The slogan was clearly borrowed from the rhetoric of another Spanish activist group, Juventud Sin Futuro [Youth without a future], the powerful student platform which turned the punk idea of having 'No Future' into a galvanizing political statement. From the outset, Rajoy's government dismissed the whole idea, and the main conservative newspapers in Spain printed their headlines to match: “General Coercion” ran at the top of La Razón, and “Strike Against Spain” decked ABC. Streetlamps in Madrid were turned on in bright sunlight, burning needlessly in a blatant effort to increase electricity consumption for the day given that one of the clearest ways to measure a drop in industrial production—a metric of success for the general strike's work stoppage—is to measure electricity use. According to the Sindicato de Estudiantes [Students’ Union], the strike had a massive following within several high schools. In the universities, the strike's following was inconsistent, but two of the most important centers – the Autónoma and Complutense universities of Madrid – were almost empty on the day of the strike. By noon, assessments of the strike were predictably different based on who was doing the assessing. While the unions considered the day a success, the CEOE employers’ association called the turnout “almost null” and the strike “ill-timed and harmful.” The polling agency Metroscopia calculated that 44% of the working population went on strike, 10% of workers wanted to go on strike but could not do so, and 2% intended to go to work but were unable to. But was 14N a general strike in the traditional sense? Antonio G., a member of Madrid’s creative activism group Gila Grupo de Intervención, says not quite. He commented on the difficulty of organizing a general strike “in a society where people no longer work in a factory-system.” Others linked to the15M movement chimed in, saying that the general strike, as a form of protest, is an old way of fighting and does not fit with the conditions of the modern city. With an unemployment rate of more than 20% and a new labor reform that makes it easier to dismiss workers, those who have a job live with the fear of losing it. In this context, for many, the demonstrations that took place throughout the day were more important than the actual halting of activity. Traditional forms of protest largely organized by the labor unions – such as the picket lines, marches and the strike itself – took place together with examples of direct action and civil disobedience, linked to the newer tradition of social movements. Some well-known actors shut themselves inside Madrid’s Teatro Español to display their rejection of cuts in culture subsidies. Hundreds of people spent the night inside hospitals, high schools and universities to protest cuts in social spending. The first stop was at Acampadabankia, a protest camp in front of the offices of Bankia, a major Spanish bank in Plaza Celenque, where protesters railed against evictions of mortgage defaulters, demanding social rent and payment in kind. 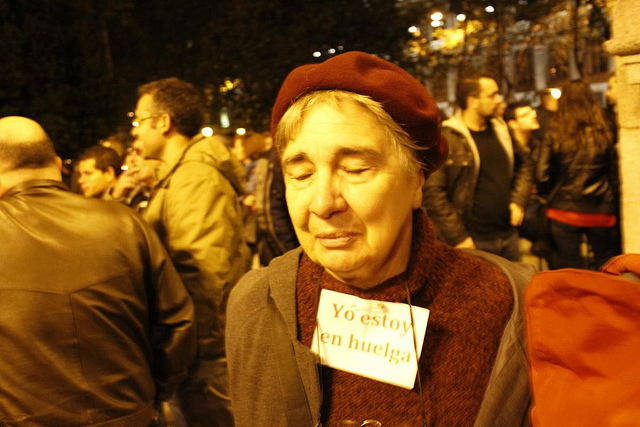 The march continued to the Princesa Hospital, one of Madrid's main public health centers. Princesa has recently been at risk of being turned into a private geriatric hospital, and has become a focal point in the fight against privatization of the healthcare system. On the way to the hospital, the march made stops at businesses that prevented their workers from joining the strike. Marchers, insisting on the right to protest, tried to force those shops to close in what sometimes were coercive gestures. Journalist and activist Marta G. thinks that this may be a dire failure of the protest effort, because the shopkeepers, who are also enduring a precarious economic climate, bore the brunt of those actions. The strikers, she thinks, may have lost potential allies in the same political fight. In the evening, disorganization mingled with violence and chaos. The protest group “Coordinadora 25S,” which made the call to surround the parliament building during the protests of September 25, had made the same call on November 14. The police violence and rioting of 25S was very much at the forefront of everyone's collective memory this time around. Cristina Cifuentes, the government delegate for Madrid, moved to forbid demonstrations in the area of the parliament building, which was now heavily guarded with police. 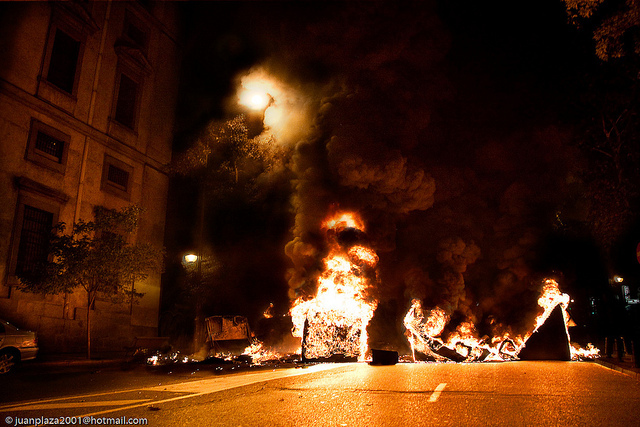 Confrontations between the police forces and protesters began shortly after nightfall. A Kentucky Fried Chicken restaurant and a La Caixa bank office near the area were set on fire. The glass windows of McDonalds were broken, and various groups set rubbish containers alight, to burn in the middle of a main street. A six-foot-tall barricade was placed across the city's Paseo del Prado, a main artery lined with museums and shops. A scene like this had not been lived in Spain’s capital city for many years, and some people see in the scent of smoke a shocking similarity with recent protests in Greece. Journalist Ana Requena Aguilar, from eldiario.es, thinks that the distance between trade unions and social movements was reduced on the day of the strike. Unions have radicalized their discourse in recent months, and some weeks prior to the strike major unions held a meeting with the group called “Plataforma de Afectados por la Hipoteca,” or “Platform of People Affected by Mortgages.” At the level of their administration, the unions and the indignados of the 15M movement have completely different tactics: the unions conduct dialogue with government institutions, while the indignados mostly operate within tropes of direct action and civil disobedience. But at the level of their organizing, the overlap between the two is steadily growing. Many union-affiliated people who did not particularly identify with the radical rhetoric of their 15M counterparts took part in protests and forms of action that go beyond the discourse of the trade unions they belong to. This is most strikingly apparent in the existence of groups called “mareas,” or “tides,” which anthropologist Adolfo Estalella sees as a radically new form of street protest. Demarcated by specific colors, each “tide” defends a sector of the endangered welfare state, and show up periodically at large marches, each supporter dressed in the group's representative color. A sea of healthcare workers dressed in white mobbed the street on 14N, chanting “La sanidad no se vende, se defiende,” or, “healthcare is not to be sold, it is to be defended.” Four days later, on November 18, this white “tide” began a series of marches that coincided with days of strikes at hospitals and health centers. 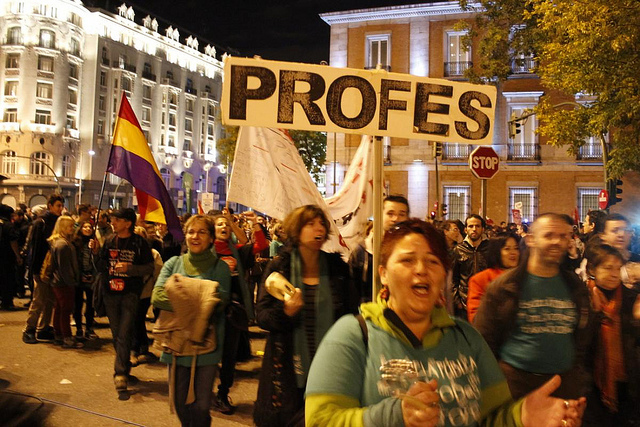 The Asociación de Facultativos Especialistas de Madrid [Madrid Association of Specialist Doctors] has called for an indefinite strike until the regional government halts its privatization plan. Public education is defended by the green tide, who have adopted a similar slogan: “la educación no se vende, se defiende.” Early in the day, a group of students dressed in green managed to temporarily blockade Madrid’s A-6 motorway. At Madrid's Universidad Complutense, one of the most prestigious universities in Spain, there is particular interest in this tide: Complutense faces impending government intervention. Meanwhile, the central government says it is not going to change any of its policies. 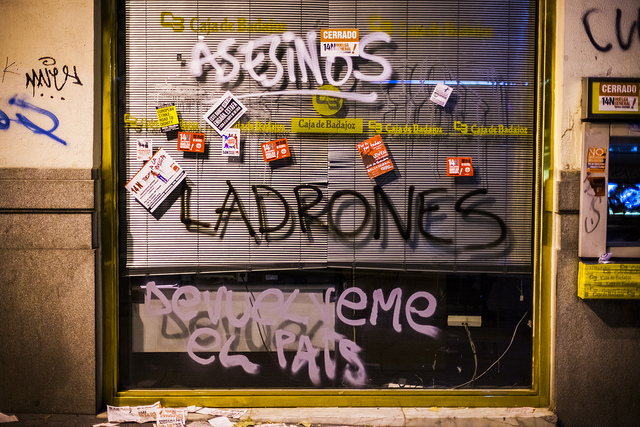 However, the strikers in Spain have seen small victories: a new law on house evictions keep the most vulnerable families in their homes for two years, and (at least for the time being), the privatization process of Madrid's Princesa Hospital has been put on hold. Many consider these measures to be insufficient. But they are something, and Paris R. is still hopeful. “It feels like we are living in a historic moment,” he said. Julia Ramírez Blanco Julia Ramírez Blanco is an art historian and critic based in Madrid, currently writing her PhD on contemporary art and utopia. She has taught at Tufts University and Skidmore College in Madrid and published several texts including the prologue for the Spanish edition of Hans Prinzhorn´s Artistry of the Mentally Ill (Expresiones de la locura, Cátedra, 2012) and a Spanish translation of Erwin Panofsky´s Gothic Architecture and Scholasticism (La arquitectura gótica y la escolástica, Siruela, 2007). She is especially interested in the intersection of art and politics, and she has collaborated with a variety of magazines as well as the newspaper El Mundo.